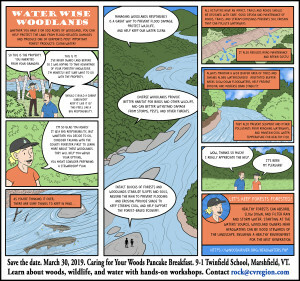 Water Wise Woodlands is a partnership project between the Central Vermont Regional Planning Commission, Friends of the Winooski River, the Vermont Woodlands Association and VT Dept. of Forests, Parks, and Recreation; with funding from the High Meadows Fund. Whether you have 5 or 500 acres of woodland, you can help prevent flood damage and produce one of Vermont’s most important forest products—clean water! Healthy woodlands can absorb, slow down, and filter rain and storm water. Starting at the waters’ source, woodland owners in the Winooski Headwaters can be good stewards of the landscape, ensuring a healthy environment. With funding from the High Meadows Fund, CVRPC has partnered with Vermont Woodlands Association, Friends of the Winooski, and Winooski Headwaters Community Partnership. Also as part of this partnership several area residents joined us for three walks in the woods this fall to learn more about forest stewardship activities taking place in the Upper Winooski Watershed. See some great pictures from our walks in Marshfield, Plainfield & Cabot. The Forest Stewardship Program is a nationwide effort led by the US Forest Service and implemented through State Forestry organizations. The purpose of the Forest Stewardship Program is to help family forest owners with advice and assistance in caring for and enjoying their woodlands. Forest Stewardship is supported in Vermont through the County Foresters who can help landowners with guidance for plans that address multiple values. Your forest management plan is the written story of your woodlands. It contains the hopes and dreams you have for your land and chronicles changes to your woods over time. Forest management plans are important because they list goals and outcomes, whether you are building a trail or cutting enough firewood to heat your home every year. Forest management plans always include maps. Maps display the property boundaries of your land, the location of different forest stands (groups of trees of similar type and age), roads, trails, and streams. Other features noted on maps are hills, wetlands, openings, and buildings within the forest, as well as a size approximation and location of your woods within the larger landscape of the forest. Cost share and incentive programs designed for forest landowners are valuable ways for landowners to accomplish conservation work on their land. The program offerings are subject to change over time; to stay abreast, check websites, landowner groups, and newsletters often. The main federal agencies that currently provide funding for specific management activities on private lands are the Natural Resource Conservation Service (NRCS) and the Farm Services Agency (FSA). The NRCS provides funding for forest plans and forest improvement work through their Environmental Quality Incentive Program (EQIP). They also provide funding for wildlife habitat, and road and trail improvement to protect or improve water quality. Some forest landowners may also qualify for technical assistance on managing lands deemed valuable for wildlife habitat through the Vermont Fish & Wildlife Department or US Fish and Wildlife Service. Promote implementation of new ANR Riparian Management Guidelines. Provide water resource rules and flood resilience training to landowners. Develop “optimal conservation practices” (OCPs) for enhancing flood resilience and water quality in forested watersheds. Engage private landowners as key partners to implement land management practices that reduce hazards and support healthy ecosystems. Use regional networks to support watershed-scale planning and enable municipalities to collaborate across jurisdictions to set priorities and make cost-effective investments that reduce hazards for downstream communities and development. Support local resilience networks that bring together planning boards, conservation commissions, emergency managers, social service providers and other leaders to develop a shared vision for resilience within a community. Invest in education and outreach to increase public literacy regarding river science and floodplain management practices. Forest Adaptation Strategies for All Forests – Increase forest cover in riparian areas and upland forests adjacent to riparian areas and wetlands to moderate stream temperatures, maintain wildlife corridors, and mitigate flooding impacts. Natural Community Adaptation Strategies – Promote landscape connectivity. Protection of the stage was mentioned earlier, but protection alone is insufficient. Connecting intact areas of forest across an increasingly developed landscape is essential. Landscape-level planning; identification of critical connecting landscapes; and protection of these landscapes through land use, zoning, and conservation easements should be priorities. At local scales, riparian area corridors can be restored by expanding forest cover from adjacent forests. Likewise, habitat corridors along field edges and in abandoned farmland could be enhanced through reforestation. Increased funding would facilitate the purchase of conservation easements. A conservation community should not overlook the eligibility of aggregated small parcels to create connected landscapes.